Long stem, grass hay is a recognizable feedstuff to calves. Photo courtesy of Troy Walz. Proper management during the receiving phase is critical to overall health and long-term performance of cattle in the feedlot. Newly weaned calves are faced with the stress of separation from the cow, deprivation of feed and water during transportation, and adaptation to the feedlot environment. 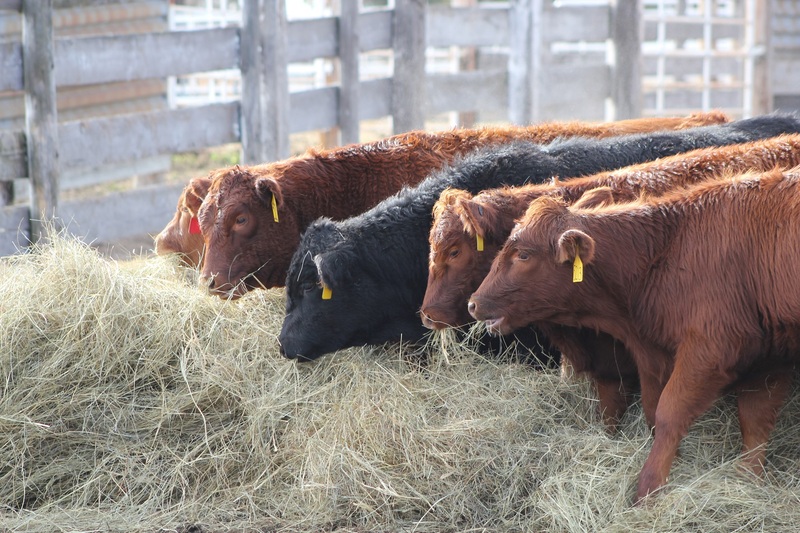 Whether calves are being introduced into a backgrounding or finishing program, implementing low-stress management practices to ensure this is a smooth transition for incoming calves becomes a major priority. Considering water intake heavily influences feed intake, calves should have unlimited access to clean water. Some calves have only drunk water from ponds or tanks, so they will not recognize automatic or ball waterers. Allow water to overflow or use an open waterer to promote water intake. Long stem, grass hay is a recognizable feedstuff to calves and should be placed in the bunks prior to arrival. Providing a mixed ration at approximately 0.75% of body weight on a dry matter basis for the first day’s feed delivery and progressively working up to 2.5% of body weight within 14 – 28 days is an effective strategy whether calves are fed a series of step-up diets or program fed the final diet. The amount of time it takes to reach the target intake will depend on the risk level and background of the calves. When transitioning from one step-up diet to the next, deliver the same pounds of dry matter as the previous day’s feed delivery to avoid depressing intake. Delivering a consistent ration at the same time each day can help mitigate digestive upsets and maintain target feed intakes as well. Since intakes are relatively low during the receiving phase, the diet should be formulated with palatable, high-quality feedstuffs. Receiving diets should be low in starch and consist of highly digestible fiber sources. Avoid feeding cheap feeds or by-products that vary in composition. Inclusion of silage in receiving diets should be limited as it is not a familiar feedstuff to calves and may lead to clostridia problems. Calves do not tolerate nonprotein nitrogen sources such as urea. Plant protein sources such as soybean meal, canola meal, or cottonseed meal are preferred. Vitamins and trace minerals, such as vitamins A and E, zinc, and copper, play an important role in immune function and should be provided at appropriate levels for stressed calves. With regards to transit time, allow calves to rest prior to processing. It is well known that vaccinating stressed calves results in a poor vaccine response. Practice low-stress cattle handling at all times and use working facilities that are appropriate for processing calves. Consider delaying administration of implants until calves are on a steady plane of nutrition. Developing a receiving protocol can help feedlot operations better prepare for incoming calves. Work closely with your nutritionist to ensure receiving diets meet the requirements of newly weaned calves. Not only is proper bunk management a key component for efficiently starting calves on feed but also maintaining target intakes throughout the feeding period. Management during the receiving phase should not be overlooked as it sets the stage for long-term performance of cattle in the feedlot. This is a summary of an article originally featured in “Progressive Cattlemen” magazine: https://www.progressivecattle.com/topics/feed-nutrition/7491-give-newly-weaned-calves-a-proper-start-on-feed.